This, in my humble opinion, is something that has been long overdue. I have been following Mark’s career for almost 40 years. He, without question, is considered to be one of the most prolific musical talents that has come from the CNY area. 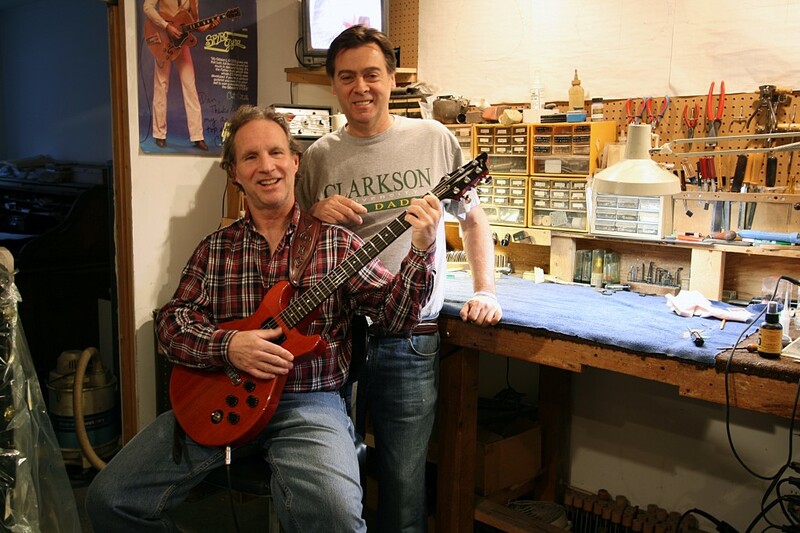 Until just a few weeks ago I have never had the pleasure to meet with Mark and talk guitars. 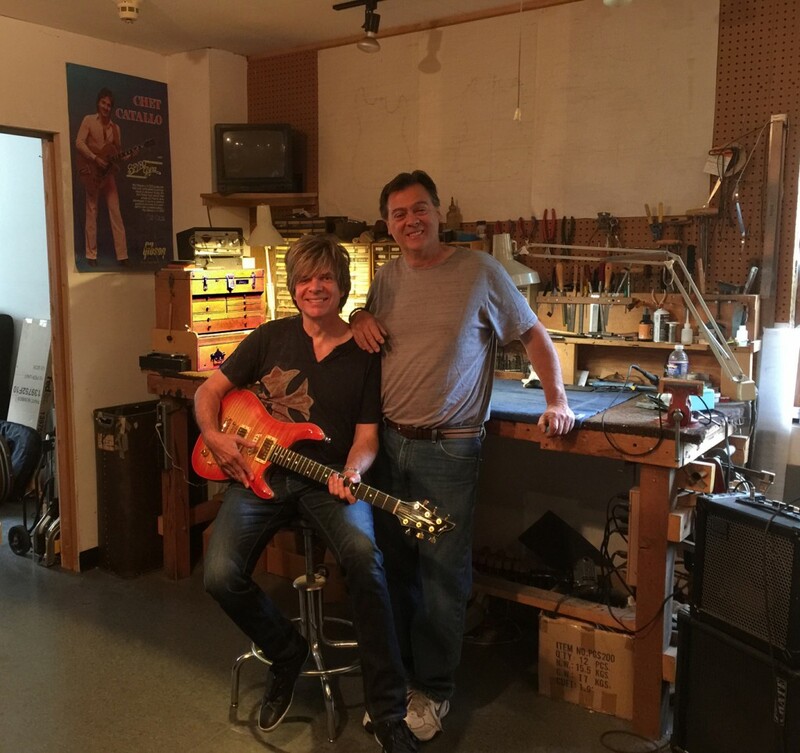 Mark and I will collaborate on a signature series of guitars that we will make affordable and available to all you guitar players out there. It is truly an honor to have Mark as a player rep for Dishaw Guitars, not only is he a great musical talent, he is a genuinely nice guy and an easy hang. So go out and see Mark and the Maniacs play his Dishaw Custom Shop guitar and feel free to talk with him about what we have in store. I meet Jerry several years ago at a NY billiard event. Jerry, in himself is an incredible tile craftsman, needless to say, we had a common ground and have become good friends, plus him buying a cue didn't hurt at all. Over the years Jerry and I had the opportunity to trade crafts, he did some work for me and I did some work for him. March 2012 my mother passed and was left with her home to get ready to place on the market. Jerry came in and gutted the bath room and retiled all the walls and the tub area, in addition to installing new tile floor in the kitchen. He also did a few things for me at my house, needless to say I was happy to make this guitar for all the incredible work he did for me. Jerry is a pool player, guitar player and golfer, my kind-a guy. I cant say enough about his integrity and the quality of his work. Jerry can be reached at 315-398-1547. 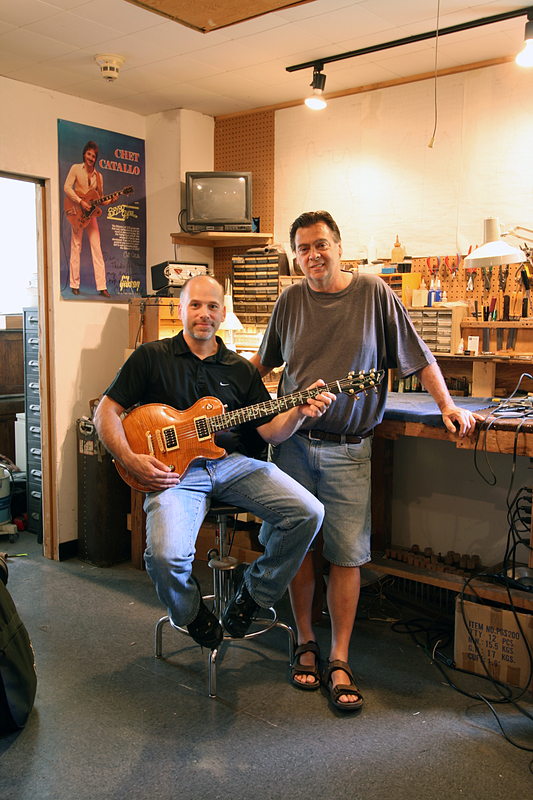 This Guitar was built around a set of very old P-90 pickups that Terry had from an early 60's Gibson. This guitar features the very same neck thru the body design that is a major part of the Dishaw Guitar Line. The hardware is from TonePro, with Grover tuners. A requirement for Terry was that the P-90 pickups had to be hard fastened to the body which means there is no suspension mounting screws. These pickups are bolted directly into the body producing incredible sustain and tone. This guitar is a screamer. mahogany body with vintage aged wine red finish. 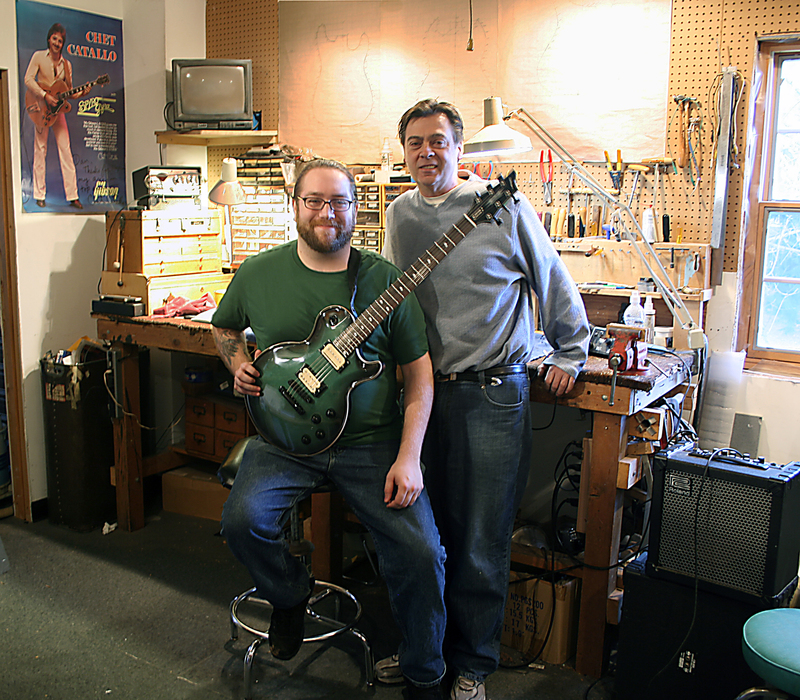 Terry has been a life long friend and client, it is always a treat to see him come to the shop, plays a little and keeps me up to date on the music scene in CNY. For well over 40 years,Terry is one of the most respected and requested blues guitarist in the area. Here is the latest Guitar from the Dishaw guitar custom shop. The Body is constructed from Ash, the top and neck is clear hard-rock maple with a high gloss black finish. The top has a green burst finish with natural binding, all hardware is Tone Pro with Sperzeil locking tuners. Electronics feature a 3-way selector switch, 2 vol., 2 tones which are push/push pots that splits the Seymour Duncan pickups coils to provide an amazing array of tone variations. Hailing from Minetto NY, Thom has been playing guitar professionally since age 16. Now at 28 he is a senior at the Berklee College of Music in Boston. Thom performs with various groups almost 80 dates a year. Wish Pool (www.wishpoolband.com) is five piece hardrock outfit with two albums released “Resurrected” and this year’s “Tabula Rasa”. Thom and the boys have toured all over the north east, even playing along side Alter Bridge, Theory of a Dead Man, Black Stone Cherry, Red and many others. While at school in Boston MA, Thom is the lead singer and guitarist of Celtic Rock standouts Dublin Free Press (http://www.dfpband.com). Playing weekly all around Mass and greater New England, DFP is a fixture in the scene. With an energetic stage show and tight playing DFP landed a weekly gig at Lansdowne PUB in Boston and has Played the pre-party for the yearly St. Patricks Day Dropkick Murphy’s show next door at the House of Blues. Recently Thom was asked to join metal Legends Freya. (http://www.facebook.com/freyaband) Lead by the indelible Earth Crisis front man Karl Buechner. With four albums put out on Victory Records, Freya is in the process of recording their new album “Paragon of the Crucible” the sequel last years “All Hail the End”. With East Coast, West Coast and beyond touring in the works, Thom is going to be busy showing off his Dishaw guitars. What a treat to see Mark Kendall of Great White still out night after night rock-in with his Mark1 Signature Guitar from Dishaw Guitars. There is no nicer human being on this earth than the legendary guitarist Mark Kendall. Rock on my friend. Vintage Guitars and Amps, guitars from all makes, models, and price. This weekend at the United Inn, Buckley Rd. Syr. NY. I will be unveiling the new Terry Mulhauser Signature Series Guitar at this weekends CNY Guitar Show. 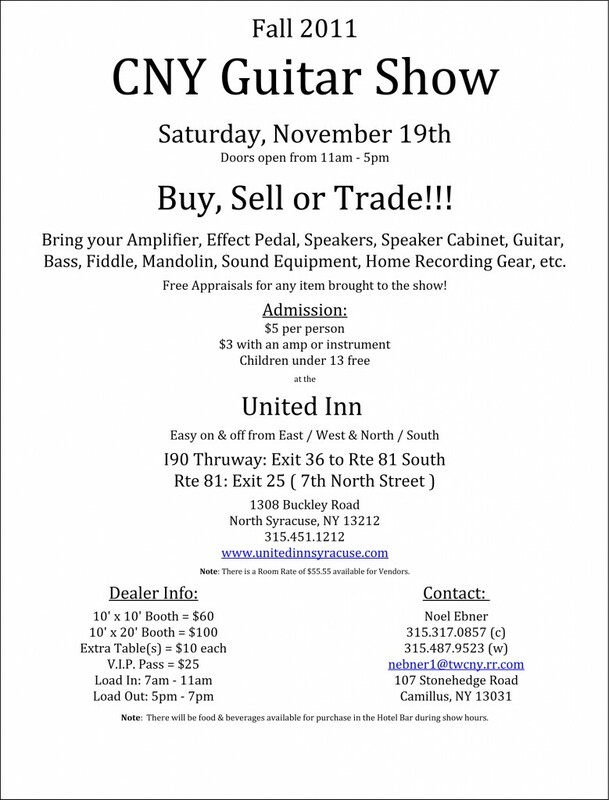 The United Inn will host this event where you will have the opportunity to try out gear from 20 plus vendors from all over the east coast. electric/acoustic guitars, basses, guitar/bass amplifiers, all sorts of electronic gear, from pickups to pedals, etc. In addition, I have my double cutaway strat style and LP single cutaway style guitars for you to kick the tires on. I will have a demo guitar showing you how the neck thru the body design is constructed. I will also have an assortment of pickups for sale, from Seymour Duncan and EMG, active tone controls, GHS Strings, TonePro bridges, stop tailpieces, Sperzil tuners and much more. All sorts of guitar parts to complete your rig.